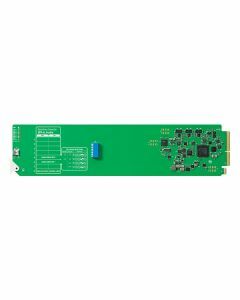 OpenGear Converter SDI/HD-SDI audio de-embedder to 8 ch AES/EBU or 4 ch analog audio. Includes everything you need to de-embed 4 channels of analog audio or 8 channels of AES/EBU digital audio from any SDI video connection. Easily access the audio in any SDI video connection for output to audio equipment such as audio mixers, analog broadcast decks, audio monitors and more. SDI Video Input: Switchable between SD, HD and Level B 3 Gb/s SDI. Analog Audio: 4 channels of professional balanced digital with openGear standard 3 pin connections. AES/EBU Digital Audio: 8 channels of professional balanced digital with openGear standard 3 pin connections. Multi Rate Support: Auto detection of SD, HD and Level B 3 Gb/s SDI inputs. SDI Compliance: SMPTE 292M, SMPTE 259M, SMPTE 296M, ITU-R BT.656 and ITU-R BT.601. SDI Video Rates: SDI video connections are switchable between standard definition and high definition. SDI Audio Sampling: Television standard sample rate of 48 kHz and 24-bit. SDI Auto Switching: Automatically selects between SD-SDI, HD-SDI and 3 Gb/s SDI. SDI Format Support: 625/25 PAL, 525/29.97 NTSC, 1080PsF23.98, 1080PsF24, 1080PsF25, 1080i50, 1080i59.94, 1080i60, 720p50, 720p59.94 and 720p60. Software Control: Mac OS X and Windows software upgrade via USB. Internal Software Upgrade: Via included updater application. Mac OS X 10.9 Mavericks, Mac OS X 10.10 Yosemite or later. Windows 7 or Windows 8.